* If you prefer, you can see a .pdf version here (1.91 Mb). As I look out the window it appears to be snowing. But since the calendar next to the computer tells me it is April, that can only mean one thing: the cherry blossom pedals’ short lives have come to an end and they have embarked on their final journey to the ground. This is God’s beautiful way of announcing that Spring has arrived in Japan. 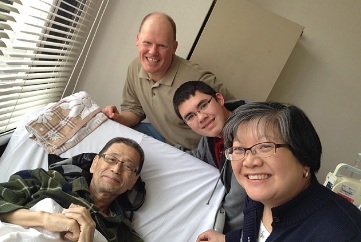 In our last newsletter, we shared the wonderful testimony of Mr. Kawano and his journey to faith in Christ. His baptism last October was easily the highlights of the short history of Oasis Church. We also asked you to please pray for him as he battled the cancer that was attacking his body. Unfortunately, Kawano-san went home to be with the Lord in mid-February. At Oasis Church we are deeply saddened by the loss of our dear friend and church family member. His warmth, sense of humor, hunger for God and desire for spiritual growth was an inspiration to us all. He will be greatly missed. But our sadness is lessened by the wonderful truth that he is now cancer free! People often talk about “losing the battle to cancer”, but as Christians, we know that death does not mean defeat...it is victory. Kawano has won! And his new, glorified, pain-free body is the proof. Thank you, Lord! During his final days, Kawano’s biggest regret is that he was not able to do more for God by telling people about Jesus. However, what Kawano was unable to do in life, he was able to do in death. Over 150 people attended his two funeral services, most of whom were not Christians. At both services, Michael was able to share of Kawano’s own journey of faith in Christ, followed by a simple explanation of the hope, peace and eternal life that God offers to those who believe in Jesus. 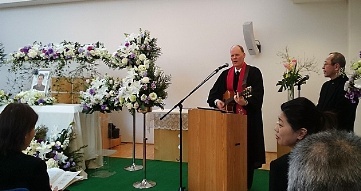 We ended the services by singing Kawano’s favorite song, “Friend of God.” What a joy it was to see hundreds of people singing about a God who wants to walk in friendship with us. PLEASE PRAY for all of those who attended the funerals. Many of them were probably hearing the Gospel message for the very first time, and we trust that many seeds were planted. Please pray that these seeds will grow and produce fruit that will last. PLEASE ALSO PRAY for Kawano’s wife, Michiyo. For the last year or so, Kawano was more than just her husband; he had also become her brother in Christ. Their time together as fellow believers was way too short, and makes the loss that much more painful. She seems to be doing well, but we know she needs the daily comfort of her loving heavenly Father. 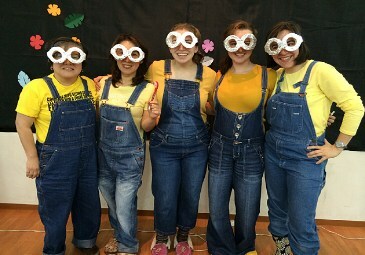 The ministry at KCS continues to go well. In January, Chris’ status changed from part-time teacher to full-time staff member. Her additional responsibilities now also include spending a couple of hours each day helping out in the office. Although this is now the third different hat that Chris is wearing at the school, she is thankful for the opportunity to serve the students and families of KCS. As Chris looks ahead to next school year, there will certainly be changes in store. How big those changes might be has yet to be determined, so we ask that you PLEASE PRAY that God would lead and guide those who are making staffing decisions for the 2015-16 school year. May the Lord place Chris in the exact situation where she can have the greatest impact on the lives of the people around her. In May, Michael will be finishing up his year as KCS chaplain. His message series for the last 9 months has been called “Holding on to the Promises of God.” PLEASE PRAY for Michael as he speaks to the students on May 1st & 29th. May the Lord use his words to speak to the hearts of the students, that they may grow as genuine followers of Jesus. It has already been two years since our last home assignment, which means that it is time once again to make our bi-annual trip to the States. We will plan to be in America for two months, from mid-June to mid-August, and most of our time will be spent in Southern California, with quick trips to JEMS’ Mount Hermon Family Camp and Spokane, WA. In the past, the main purpose of our time in the States has always been to visit our supporting churches. While this is something that we are still looking forward to doing, this time we are also feeling the need for some much-needed rest, refreshment and refilling. To this end, we ask that you PLEASE PRAY for our time of visiting churches. May the Lord use us to be a blessing and encouragement to others as we share about the ministry in Japan. But may we also be able to receive the blessing and encouragement that we need as we look ahead to our next term. Thank you once again for your prayers and support for us. We deeply appreciate and value your partnership with us, as together we serve the Kingdom of God in Japan.